ST. GEORGE — Police and family members are searching for two St. George teens who reportedly went missing Thursday evening. 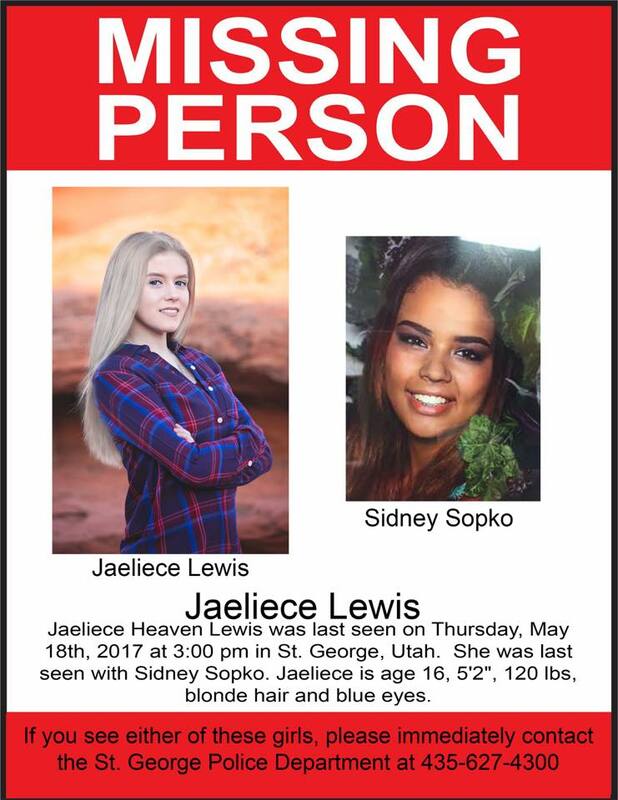 St. George Police are asking for the public’s help Friday in locating 16-year-old Jaeliece Heaven Lewis and 17-year-old Sidney Sopko. The girls were seen together at approximately 2 p.m. Thursday, St. George Police Officer Lona Trombley said. Lewis told her family she was going to the Bloomington Wal-Mart on Thursday, Christian Warmsley, a private investigator on the case, said. “From there, that’s when all communication was gone,” Warmsley said, noting that Sopko may be trying to avoid legal issues and may have convinced Lewis to run away with her. Anyone with information regarding Lewis’ or Sopko’s whereabouts is asked to call the St. George Police Department at 435-627-4300. This report is based on preliminary information provided by law enforcement and others close to the case and may not contain the full scope of findings. They probably went to vegas to party. Hopefully they don’t come home pregnant or with a drug addiction.